Many of us at TCF fish primarily freshwater, but are starting to get more into saltwater. After asking around, we found that it was easy to get started by using something us bass fishermen are familiar with – the spinnerbait! In this article we highlight the using the saltwater spinnerbait. 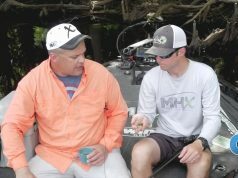 We talked to some folks at the local bait and tackle shop that turned us on to some of these saltwater spinner baits. Coming from the freshwater bass fishing area, this was a dream come true, because i know how to work one of these. They’re a little bit different, the wiring itself is a little bit sturdier, basically a higher gauge wire than freshwater spinner bait. You don’t want to work the willow blades so much, you want a Colorado blade. It gives off a lot more water displacement and thunder, and lets them know you’re coming. The color we chose was white. We basically looked at the water and saw a bunch of bait around this size and color, so we are trying to mimic the environment. 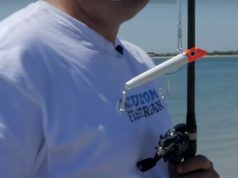 So if you are a freshwater person looking for an easy migration to saltwater, give a saltwater spinnerbait a go!